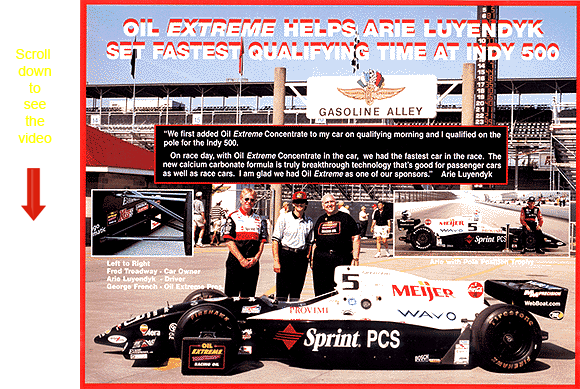 A story George French, Oil Extreme's Founder and President likes to tell, is the year Indy broke his heart. The story goes like this: The week before qualifying George made a deal with Treadway Racing, the owners of Ari Luyendyk's car, to be one of their sponsors. One of George's conditions was that they use Oil Extreme Concentrate in their car. By the time their negotiations were finished and the technical information on the Concentrate was given to Treadway's engineers for approval for use in their car's engine, it was late in the week before the product was shipped. In practice runs all during the month of May, Ari was consistently a mile slower then Greg Ray. No matter what they did to the engine or chassis, Ari couldn't do better than 2nd fastest time. And that's where it stood on qualifying morning, when the UPS man delivered the bottles of Oil Extreme Concentrate. Treadway's mechanics poured in 2 ounces of the Concentrate to every quart of their regular racing oil, warmed up the engine and when it was Ari's time to qualify went out and qualified at 225.179 to Greg Ray's 225.073, which gave Ari the pole position, and about a quarter of a million dollars for having the fastest qualifying time. Oil Extreme Concentrate cut friction so much that Ari actually gained an extra mile an hour. Of course, when George heard this he immediately hopped a plane to Indianapolis so he could be there for the following week's race. On Race morning, Fred Treadway, Ari Luyendyk, and George posed for the picture above. George was told he could watch the race from track side or he could watch the race on TV from Treadway's huge motor home parked near the pits. Since the motor home was stocked with food and all kinds of refreshments, after the start of the race George choose to watch the race from the motor home, because you could see all the track. At the start Ari jumped right out into the lead. It was evident that he had the fastest car in the race, as he lead a total of 63 laps. After each pit stop it wasn't long before he was back in the lead, and at lap 117 of the 200 lap race he was leading comfortably. One of Treadway's managers had told George that half way through the race, if Ari was leading, to get ready, and they would come and pick him up with the golf cart to take him out to the starting line so he could be there for pictures in Winners Circle. Of course, George wanted to look his best for television, so he was combing his hair, and getting ready, when the next thing he saw on TV was Ari getting into a problem when he was passing a back marker. The other car sent Ari into the wall, smashing the car beyond repair. Luckily Ari was OK, but as George likes to say, it broke his heart. For anyone that has tried to conquer Indy, they will know that anyone who has success their first time there is mighty unusual. And, to sponsor a car that sets fastest qualifying time the first year is fantastic. But, it's a memory George will cherish forever. Click on image below to watch Arie start on the pole at Indy!